No two learners are the same. While some students might struggle to study in solitude, others might thrive on the independence. Where one student can’t sit still in class, another might need that structure to get their work done. There are, in fact, seven common learning styles. So, what can you do to make the most of yours? We’ve put together an explanation of the seven most common learning types and our advice on how to create your ideal study environment. Aural learners work best with sounds and music. They tend to do well in the classroom because they have great listening skills. These learners can often be seen humming or tapping out the rhythm to a song while they concentrate. They also tend to know all their favorite lyrics by heart and all the themes from their favorite TV shows. At school, aural learners may play musical instruments, write songs, or sing with a choir. If this sounds like you, you could use sounds, rhyming or music to aid your learning or memorization processes. Try finding a study soundtrack that you can use each time you sit down at your desk to get in the mood. You could also set facts or quotes you need to remember to music – write songs or just tunes to memorize your way through a topic. Another trick is to create mnemonics or acrostic poems. A verbal style of learning involves reading, writing and speech. For verbal learners, the textbook is a friend. They learn best from putting their thoughts down on paper or getting them out in a lively debate. They are expressive and articulate types, who love tongue twisters, books, poems and discussions with friends. At school, verbal learners might be involved in public speaking, writing or student journalism. If you’re a verbal learner, try reading your notes aloud and use repetition to memorize key facts. Make sure you make your reading dramatic and varied in tone – better still, get yourself an audience! A lively and energetic speech will make it easier to recall details later on. You could also try recording yourself running through lists of information or working through a complicated theory or topic. Just listen back to the recording later for revision! Physical learners often have a hard time in traditional classrooms. When learning new skills or topics, they’d rather jump in straight away. They tend to fidget through lectures and get frustrated with sitting still. Physical learners have their best ideas while being active. If something is bothering this type of student, they often find a walk or run is enough to clear their head. At school, physical learners are usually involved in sports, drama or dancing. For physical learners, I’d recommend staying active throughout periods of study. This can involve drawing diagrams, creating revision cards (which you can take with you on the move) and taking short walks or runs to process information. You could also use visualization to animate whatever you might be studying. For example, imagine your way through the physical actions of a chemistry experiment. Visual learners use pictures, colors and maps to organize and memorize information. These learners do best in the classroom when the whiteboard is in use, and they tend to have beautiful revision notes. Visual types are also often great dressers, with a clear idea of what colors and patterns work together. At school, visual learners usually gravitate toward activities like photography, art and design. If this sounds like you, you’re going to need to invest in some good stationery. You’ll need bright paper, colorful sticky notes and pens in every color of the rainbow. Spend time on your revision notes and make sure they’re a useful visual tool. Color coding information, making visual connections between topics, mind mapping, forming visual journeys through new topics or timelines – these are just some of the techniques a learner like you could use. Students who have a logical learning style are organized and manage their time effectively. They usually have a flair for mathematics, recognizing patterns, and they are capable of performing complex calculations in their head. These learners work through problems systematically, setting themselves to-do lists and targets. They also tend to enjoy video games that allow them to practice strategy and problem-solving. In school, logical learners might be involved in math, robotics or computers. If you think you’re a logical learner, you’ll probably already know what works for you. Write lists, categorize information, make connections and work through your study material in a consistent and organized manner. But, try to resist the temptation to memorize the bare minimum you need from each lesson. While you study, use your class notes and then push yourself to explore further, find new links, understand what surrounds the content. This way, you’ll have an easier time remembering the material, and you’ll have that extra level of knowledge you need to push up your grades. Solitary learners are introspective, independent and very self-aware. These learners usually have a high level of concentration and spend time questioning themselves, analyzing their thoughts, opinions, actions. 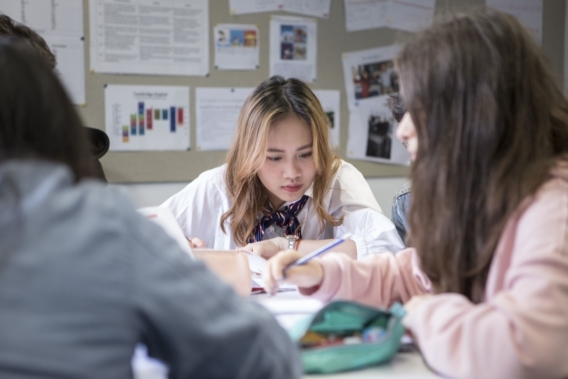 Through developing a deep understanding of themselves, these learners are confident in their ability and don’t usually require much teacher support. At school, they’re likely to be reading, painting or studying. If you’re a solitary learner, your first impulse will already be to retreat and manage your studying on your own. That’s okay as long as in class, you give your teacher your full attention and try to contribute to discussions as much as possible. In your own study time, try to generate some personal interest in your topics. Make them important to you by finding characters you can relate to or a theory you agree with. Use your empathetic skills to connect to your study material. Learners with a strong social style tend to be excellent communicators, both verbally and non-verbally. They’re sensitive to other people’s views, great listeners, and usually quite out-spoken in class. These learners are in their element in group discussion-based lessons, where they get the chance to bounce off other people and offer their opinions. In school, social learners prefer team activities like football, basketball or hockey. If this sounds like you, it’s obvious that you do best when working alongside other people. Try forming your own study group. You don’t all need to be from the same class; you could even approach one topic from each of your different standpoints. For example, get English students, mathematicians, scientists and historians to discuss the impact of technology. You’ll thrive from the company and gain some new perspectives which will add context to your own studies. No matter what type of learner you are, at EF Academy the learning experience is catered to suit each individual student. To learn more about what we offer, please read on.